We are so proud and honored to have been chosen as Wonder Women and featured on today’s DVLF website. We are only as strong as the entire community that supports us. Many thanks again to everyone. If Linda and Arleen are, indeed, only as strong as the community which supports them, then the Northwest has fostered the growth and cultivation of two truly inspirational individuals. 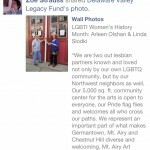 Even photographer Zoe Strauss can’t resist taking time out of her busy schedule and current exhibition at the Philadelphia Art Museum to give them props! Linda and Arleen, I think I speak for all of us when I say: May your dreams continue to evolve with the expansion of the Art Garage!